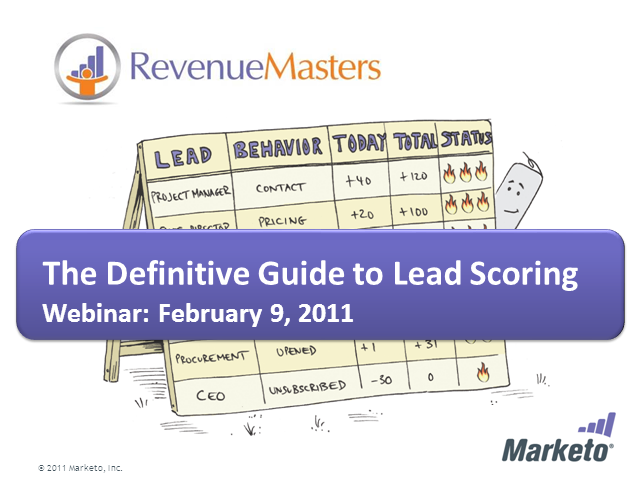 Join Jon Miller and Andrew Spoeth, two of the authors of the Definitive Guide to Lead Scoring, as they walk through the highlights of the new Definitive Guide and share the top things to consider when improving lead scoring at your company. Built by marketers, for marketers. Marketo combines everything you need to manage demand generation campaigns and generate quality sales leads – including email marketing, lead nurturing and lead scoring – with analytics to measure marketing ROI and forecast marketing’s impact on revenue. But unlike other marketing automation solutions, Marketo’s delivers this sophisticated functionality with a flexible and easy user experience that enables faster success, with less risk.